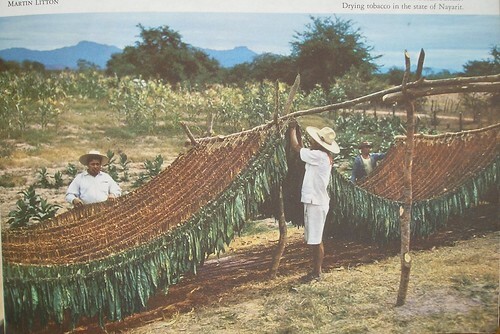 curing tobacco, originally uploaded by bunky's pickle. Once the tobacco has been cured, many types of tobacco undergoes further processing by adding a scent. In some the perfume is more distinct than other, such as in cigars and pipe tobacco. Once the leaves have completed fermentation and curing and prizing, the may be sprayed with an appropriate perfume for their final use. There are different tobacco perfumes for cigars, cigarettes loose-leaf tobacco, snuff, shag, etc. Some of the essences most popular for use in tobacco perfume are: vanilla, tonka bean tincture (as well as coumarin), vanilla (most popular in cigar perfumes), cedarwood, rose otto, sandalwood, patchouli, cascarilla, geranium, orris tincture, citrus oils, and even expensive flower oils such as orange blossom, tuberose and jasmie (in Turkish and Egyptian cigarettes), spices (such as cinnamon, cloves and nutmeg) and spirits such as brandy. In Middle Eastern tobacco for narguilla (aka shisha or hooka), tobacco is sweetened with molasses, honey and dried fruit and blended with flavours such as rose, mint, apple and other fruit. Tobacco absolute is solvent extracted from the cured tobacco leaves. Only a very small portion of the tobacco produced is extracted for perfumery uses though. The absolute is a thick dark brown (almost black) semi-solid mass which discolours perfume into a dark brownish green (posing a disadvantage right there and than to the perfumer). An incolour absolute is also available, reducing that disavtange to some extent. The scent of this absolute varies depending on the quality of the tobacco leaves extracted. Some can be more flat, dry and woody, with a certain tannin-like quality, reminiscent of black tea and mate absolute and with musky undertones. Other can be fuller, more animalic and rounded, with more body and nearly chocolate-like richness. Although potent and long lasting, tobacco is a scent that can easily get “lost” in a composition, and in a sense – less is more. It really needs to be diluted down to be fully appreciated as a raw material; and needs to be used in a small quantity with complementary essences in order to truly shine. Tobacco is obviously a key component in the tobacco and leathery families. With its tannin quality, it makes a perfect base for leathery scent, along with castoreum or hyraceum tinctures, and cade oil or birch tar. And of course for the tobacco families – all one needs to do is take sufficient amount of tobacco and tobacco-like essences and pair them with the essences used to flavour tobacco to create the impression of your choice (see above). Depending on what you choose, it will smell more like pipe tobacco, cigar, cigarette, etc. But the uses for tobacco do not end at the leather and tobacco families. Tobacco is a beautiful and versatie material in masculine fragrances, from the woodsy type in particular. It blends beautifully with all woods – vetiver, patchouli, sandalwood, cedarwood, juniper etc. And it adds a polished, sophisticated feel to what otherwise would have been plain citrusy colognes. Tobacco works beautifully with florals, especially rose and orange blossom. And in the citrusy or fresh context, orange blossom, lime and tobacco are a match made in heaven. If you missed the previous article about tobacco, click here and here. Next in our tobacco series: case studies of using tobacco leaf absolute in natural perfumes.